Advantages: Clear and interesting selection of photographs, informative captions, excellent artwork, superbly detailed plans. Having bought previous �� publications there was a certain familiarity that was expected when this latest edition arrived. I was interested to see how they would handle the Spad VII, this being their first World War One subject. The book is essentially an English language publication with a 4-page insert that provides a Czech translation. English readers shouldn抰 throw this away as it contains additional photos and colour artwork not found elsewhere in the book. This also includes text (not translated into English) on the Czech Spads, complete with known serial numbers. An introduction to the type is presented in the first 3 pages including a table of manufacturers and the range of serial numbers from the machines they produced. Interspersed throughout the book are at least 117 black and white photos and 17 colour ones. Everything is printed on 40 pages of good quality gloss stock. As a result, the reproduction of the photos is excellent. These pictures are a mixture of period snapshots and close-ups, as well as the familiar 搘alk around� style portrayal of museum pieces. 揚reserved� examples featured are a British (Mann Egerton built) Spad VII, B9913 from the Virginia Aviation Museum, a Bl閞iot-built Spad VII, S2489 from the Museo Baracca, Guynemer抯 original Spad VII S254 at the Mus閑 de l扐ir et de l扙space, and a Mar鏰y manufactured Spad VII, s/n 11583 which served in Czechoslovakia. This latter aircraft housed in the Hart hanger at Kbely Aviation Museum. The artwork is excellent with 13 different aircraft portrayed. Represented are Mar鏰y, Bl閞iot, Dux, and Spad built machines. Where appropriate, scrap views are shown of the upper and lower surfaces, providing extra detail of the markings and insignia. A number of extra illustrations are provided which show the internal assembly of the tailskid, control column mechanism, engine mount and external stores layout. Definitely one of the highlights of the book is a fold out section that contains the various 4 view drawings. Not only do we get the 搒tandard� plan and elevation views, but also numerous scale drawings of the many detail variations due to the different sub-contractors. 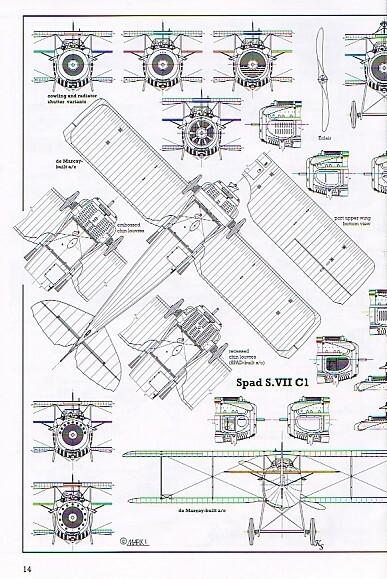 These detailed drawings are in 1/48th scale and show the differences between de Mar鏰y, Mann Egerton, SPAD, Bl閞iot, Janoir and SEA built aircraft. A plethora of additional views highlights the different cowl arrangements, louver styles, radiator types, windscreens, gun sights, machine gun installations and propellers. One of the most surprising aspects of the drawings is the depiction of the asymmetrical shape of the cockpit opening. This is one of the first titles to clearly show this feature and it is backed up with the appropriate photographic evidence. Readers should note that this feature is not be present on all Spad VII aircraft due to the refurbishing of some with Spad XIII components. On these, the shape is symmetrical. 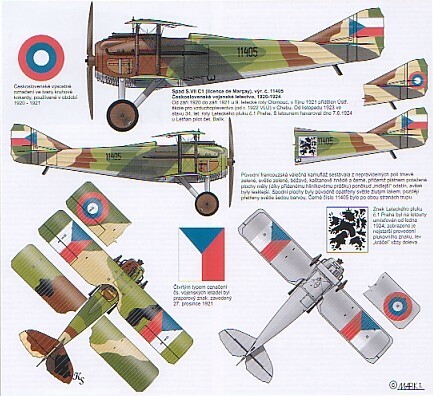 The penultimate chapter relates to the armament and equipment that these aircraft carried. There is a discussion on the problems of the early belt feeds and the subsequent solutions, the different guns used and the use of Le Prier rockets and Cooper bombs. 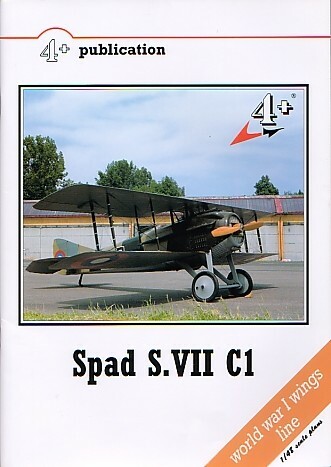 Finally we come to the colours and markings section where the reader is introduced to the painting practices that the Spad VII was accustomed to. All of the major users of the aircraft are covered to give the reader a good overall understanding of the subject. If this is how 4+ Publications is going to present World War One aircraft in their aviation range of books then I welcome them with open arms. The layout is very pleasing and there is a wealth of information is contained in the modestly sized format. The material offered is bound to get the enthusiasts talking and that can only lead to a better understanding of the type.